Parents group called “Lets Talk”, tackle different issues facing parents. Their flyer for an upcoming talk on Cyberbullying. As we all know cyberbullying is a very important and current topic of concern. 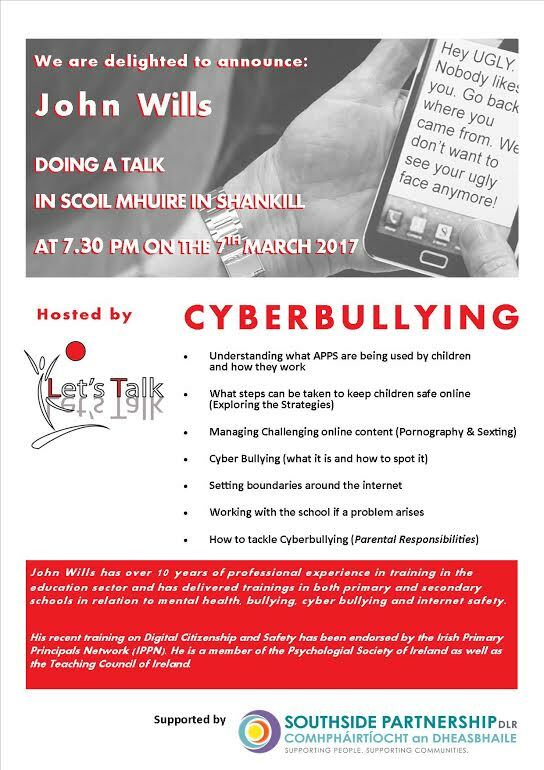 This speaker, John Wills, has extensive knowledge of working and training in mental health, bullying and internet safety. Don’t forget – you can take back control of access to the internet with our recommended simple to use app and router – So parents can have their internet and your children have what and when you decide ! This entry was posted in Internet safety, Parents info. Bookmark the permalink. ← Live Streaming the winning tickets !